The scene in Cargan on Saturday where Glenravel played their first game on their new pitch as they took on All Saints Old Boys. It was a red letter day for firmus energy Ballymena Saturday Morning League side Glenravel at the weekend. The villagers ran out for their first fixture at the superb new facility in Cargan. 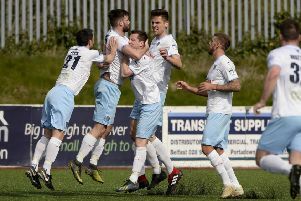 Glenravel have enjoyed a meteoric rise on the pitch, with back-to-back promotions taking them into the top tier of the Saturday Morning League this season and their new surroundings will befit their top-flight status. But there was no fairytale start for John McAllister’s side as they went down 4-3 to All Saints Old Boys.